García, O., & Kleifgen, J. (2018). 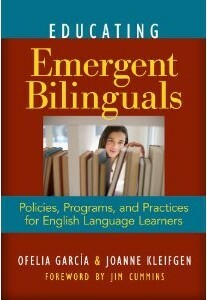 Educating Emergent Bilinguals: Policies, programs and practices for English Learners. (2nd ed.). New York, NY: Teachers College Press. Cenoz, J. & García, O. (Eds.). (2017). Breaking away from the multilingual solitudes in language education: International perspectives. International Journal of Language, Identity and Education, 16(4) [entire issue]. García, O., Flores, N. & Spotti, M. (eds.) (2017). Handbook of Language and Society. New York and Oxford: Oxford University Press. García, O., Johnson, S. & Seltzer, K. (2017). The Translanguaging classroom. Leveraging student bilingualism for learning. Philadelphia: Caslon. García, O., Lin, A. M. Y., & May, S. (2017). Bilingual and multilingual education. Springer International Publishing. Wright, W. E., Boun, S., & Garcia, O. (Eds.). (2015). 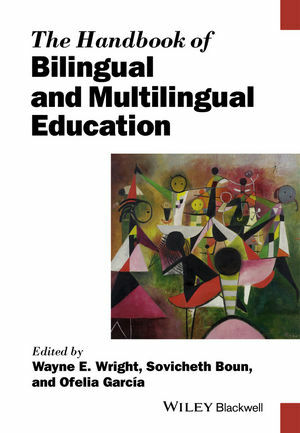 The Handbook of bilingual and multilingual education. Malden, MA: John Wiley & Sons. García, O. and Li Wei. 2014. Translanguaging: Language, Bilingualism and Education. New York: Palgrave Macmillan. García, O., Zakharia, Z. and Otcu, B. 2013. Bilingual Community Education for American Children: Beyond Heritage Languages in a Global City. Bristol, UK: Multilingual Matters. García, O., Fishman, G.S., & Fishman, J. (eds.). 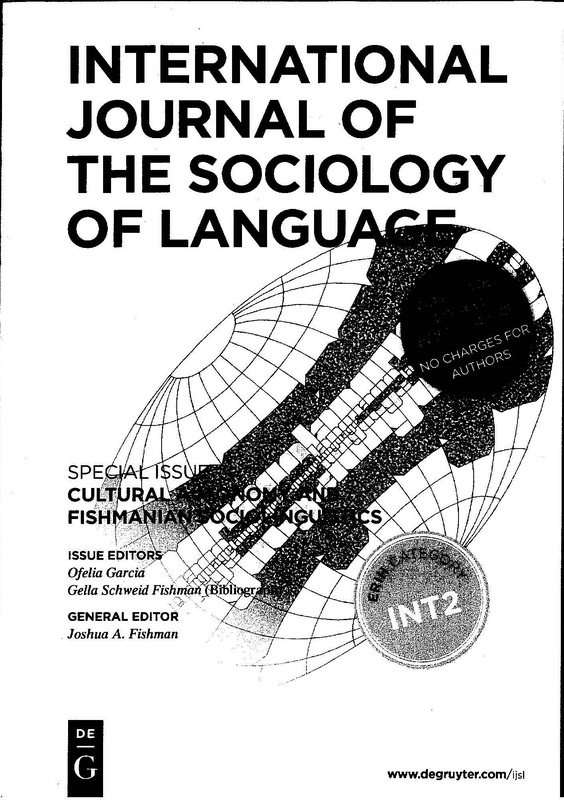 2012. International journal of the sociology of language: Cultural autonomy and Fishmanian sociolinguistics. Berlin: De Gruyter, Number 213. Bartlett, L. and García, O. 2011. Additive Schooling in Subtractive Times. 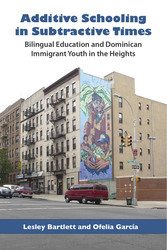 Dominican Immigrant Youth in the Heights. Tennessee: Vanderbilt University Press. Fishman, Joshua A. and Ofelia García (eds). 2011. Handbook of Language and Ethnic Identity: The Success-Failure Continuum in Language and Ethnic Identity. Vol. 2. Oxford: Oxford University Press. García, O. and Kleifgen, J. 2010. Educating Emergent Bilinguals. Policies, Programs and Practices for English Language Learners. New York: Teachers College Press. Fishman, Joshua A. and Ofelia García (eds.). 2010. Handbook of Language and Ethnic Identity. Disciplinary and Regional Perspectives. Vol. 1. Oxford: Oxford University Press. Menken, K. and Ofelia García (eds.). 2010. Negotiating Language Policies in Schools: Educators as Policymakers. New York: Routledge. García, Ofelia. 2008. Spanish as a Global Language (The International Multilingual Research Journal 2, Issue 1). Routledge: Taylor & Francis. García, Ofelia and Colin Baker (eds.) 2007. Bilingual Education: An Introductory Reader. Clevedon, UK: Multilingual Matters. García, Ofelia, Tove Skutnabb-Kangas and María Torres-Guzmán (eds.) 2006. 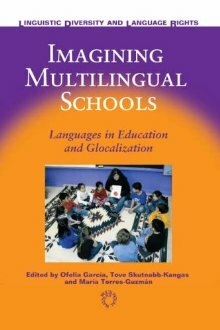 Imagining Multilingual Schools: Languages in Education and Globalization. Clevedon: Multilingual Matters. [Reprinted for the Asian market by Orient BlackSwan, Andhra Pradesh, India, 2009]. García, Ofelia, Rakhmiel Peltz and Hal Schiffman (eds.) 2006. Language Loyalty, Continuity and Change: Joshua A. Fishman’s Contributions to International Sociolinguistics. Clevedon: Multilingual Matters. García, Ofelia and Joshua A. Fishman (eds.) 1997. (2001, 2nd edition). The Multilingual Apple. Languages in New York City. Berlin: Mouton de Gruyter. García, Ofelia and Colin Baker (eds.) 1995. 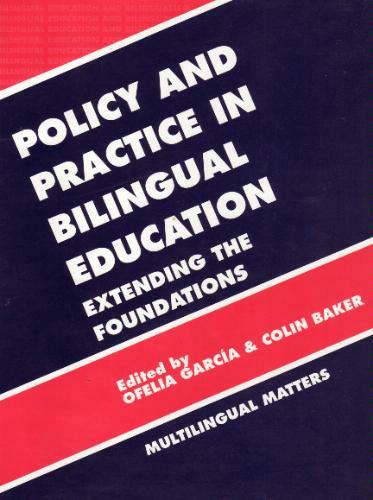 Policy and Practice in Bilingual Education. Extending the Foundations. Clevedon, Avon: Multilingual Matters. García, Ofelia, ed. 1991. Bilingual Education: Focusschrift in honor of Joshua A. Fishman. Amsterdam: John Benjamins. García, Ofelia and Ricardo Otheguy (eds.) 1989. English across cultures. Cultures across English: A Reader in cross-cultural communication. Berlin: Mouton de Gruyter. Wherrit, Irene and Ofelia García (eds.) 1989. U.S. Spanish: The Language of Latinos. (The International Journal of the Sociology of Language 79).Berlin: Mouton de Gruyter. Burunat, Silvia and Ofelia García, (eds.) 1988. Veinte años de literatura cubano-americana. Tempe, Arizona: Bilingual Review. García, O. (2019). Decolonizing foreign, second, heritage and first languages: Implications for education. In Macedo, D. (ed. ), Decolonizing foreign language education, pp. 152-168. New York: Routledge. Blommaert, J. García, O., Kress, G. & Larsen-Freeman, D. (2019). Communicating beyond diversity: A bricolage of ideas. In Sherris, A. & Adami, E. (eds.). Making signs; Translanguaging ethnographies. Exploring urban, rural and educational space, p. 9-35. Bristol: Multilingual matters. García, O. (2019). The Curvas of translanguaging. In Zhongfeng, T. and Link H. (Eds.). Positive synergies. Translanguaging and critical theories in education, pp. 86-93. New York: John Benjamins. Translation and Translanguaging in Multilingual Contexts. 5(1), 86-93. García, O., & Tupas, R. (2019). Doing and undoing bilingualism in education. In A. De Houwer & L. Ortega (Eds. ), The Cambridge handbook of bilingualism (pp. 390–407). Cambridge, UK: Cambridge University Press. García, O. (2018). Translanguaging in the Crossroads of Civilization. In R. Tsokalidou (Ed. ), SìдаYes. 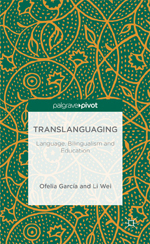 Beyond bilingualism to translanguaging (pp. 15-19.) Athens: Gutenberg Press. García, O. (2018). Translanguaging, pedagogy and creativity. In Erfurt, J., Carporal, E. & Weirich, A. (eds.). Éducation plurilingue et pratiques langagières: Hommage à Christine Hélot (pp.39-56). Berlin: Peter Lang. García, O., & Lin, A. (2018). English and Multilingualism. In Seargeant, P., Hewings, A. & Pihlaja, S. (eds.). Routledge Handbook of English Language Studies (pp.77-92). New York: Routledge. García, O., Seltzer, K., & Witt, D. (2018). Disrupting linguistic inequalities in US urban classrooms: The role of translanguaging. Van Avermaet, P., Slembrouck, S., Van Gorp, K., Sierens, S., & Marijns, K. (Eds.). The Multilingual Edge of Education (pp. 41-66). London: Palgrave Macmillan. Sánchez, M. T., García, O., & Solorza, C. (2018). Reframing language allocation policy in dual language bilingual education. Bilingual Research Journal, 41(1), 37-51. Vogel, S., Ascenzi-Moreno, L., & García, O. (2018). An Expanded View of Translanguaging: Leveraging the Dynamic Interactions Between a Young Multilingual Writer and Machine Translation Software. In J. Choi & S. Ollerhead (Eds. ), Plurilingualism in Teaching and Learning: Complexities Across Contexts (pp. 89–106). London, United Kingdom: Taylor & Francis Ltd.
García, O. (2017). Lo que los sordos le enseñaron a los oyentes: Deconstruyendo la lengua, el bilingüismo y la educación bilingüe. ANAIS 2016, Vol. 1: 34-57. Congresso Internacional. Seminário de Educação Bilíngue para Surdos. Universidade do Estado da Bahia. García, O. (2017). Problematizing linguistic integration of migrants: The role of translanguaging and language teachers. In Beacco, J.-C. Krumm, H.-J., Little, D., and Thagott, P. (eds.) The Linguistic integration of adult migrants/L’intégration linguistique des migrants adultes. Some lessons from research/ Les enseignments de la recherche (pp. 11-26). Berlin: De Gruyter Mouton. García, O. (2017). Reflections on Turnbull’s reframing of foreign language education: bilingual epistemologies, International Journal of Bilingual Education and Bilingualism. García, O. (2016). Critical multilingual language awareness and teacher education. In J. Cenoz, D. Gorter, & S. May (Eds. ), Language Awareness and Multilingualism (pp. 1–17). Cham: Springer International Publishing. García, O. (2016). Política lingüística y educación. En Gutiérrez-Rexach. Enciclopedia de Lingüística Hispánica. Vol. II, pp. 741-750. London-New York: Routledge. García, O., & Ascenzi-Moreno, L. (2016). Assessment in school from a translanguaging angle. In S. Ptashnyk, R. Beckert, P. Wolf-Farré & M. Wolny (Eds.) Gegenwärtige Sprachkontakte im Kontext der Migration. Heildelberg: Winter Verlag. García, O., & Lin, A. (2016). Extending understandings of bilingual and multilingual education. In García, O. ,Lin, A. & May, S. (eds. ).Bilingual Education (Vol. 5). Encyclopedia of Language and Education, p. 1-20. Springer. García, O., & Lin, A. (2016). Translanguaging and Bilingual Education. In García, O. ,Lin, A. & May, S. (eds.). Bilingual Education (Vol. 5). Encyclopedia of Language and Education, pp. 117-130. Springer. García, O., & Seltzer, K. (2016). The Translanguaging current in language education. In B. Kindenberg (ed.) Flerspråkighet som resurs [Multilingualism as a resource]. (pp. 19-30). Liber. Wiley, T., & Garcia, O. (2016). Language policy and planning in language education: Legacies, consequences, and possibilities. The Modern Language Journal, 48–63. García, O., (2015). Language policy. In J. D. Wright (ed. ), International Encyclopedia of the Social & Behavioral Sciences, 2nd edition, Vol 13. Oxford: Elsevier, pp. 353–359. García, O., (2015). Translanguaging and abecedarios ilegales. In T. M. Kalmar (Ed. ), Illegal Alphabets and Adult Biliteracy: Latino Migrants Crossing the Linguistic Border, Expanded Edition (pp. 131–136). Routledge. García, O., & Flores, N. (2015). What do the CCSS mean for bilingual education? How should we refer to students who are acquiring English as an additional language? and What do educators need to know about language as they make decisions about Common Core State Standards implementation? In G. Valdés, K. Menken, & M. Castro (Eds. ), Common Core, Bilingual and English Language Learners: A Resource for Educators. CASLON PUB. García, O., Flores, N., & Woodley, H. H. (2015). Constructing in-between spaces to “do” bilingualism: A tale of two high schools in one city. In J. Cenoz & D. Gorter (Eds. ), Multilingual Education: Between language learning and translanguaging, pp.199-224. Cambridge: Cambridge University Press. García, O., & Hesson, S. (2015). Translanguaging frameworks for teachers: Macro and micro perspectives. In A. Yiacoumetti, Multilingualism and Language in Education: Current Sociolinguistic and Pedagogical Perspectives from Commonwealth Countries. Cambridge: Cambridge University Press, pp. 221-242. García, O., & Li Wei. (2015). Translanguaging, bilingualism and bilingual education. In W. Wright, S. Boun, & O. García (Eds. ), Handbook of Bilingual Education. Malden, MA: John Wiley, pp. 223-240. García, O., & Menken, K. (2015). Cultivating an ecology of multilingualism in schools. In B. Spolsky, O. Inbar-Lourie, & M. Tannenbaum (eds. ), Challenges for Language Education and Policy: Making Space for People. New York: Routledge. García, O., & Otheguy, R. (2015). Spanish and Hispanic bilingualism. In M. Lacorte (Ed. ), The Routledge Handbook of Hispanic Applied Linguistics (pp. 639-658). New York, NY: Routledge. García, O., & Woodley, H. H. (2015). Bilingual education. In M. Bigelow & J. Ennser-Kananen (eds. ), The Routledge Handbook of Educational Linguistics. New York: Routledge. García, O., & Yip, J. (2015). Introduction: Translanguaging: Practice Briefs for Educators. Theory, Research, and Action in Urban Education, 4(1). Otheguy, R., García, O. & Reid, W. (2015). Clarifying translanguaging and deconstructing named languages: A perspective from linguistics. Applied Linguistics Review 6(3): 281-307. García, O. (2014). Prefácio. In I. Andrade et al. (eds. ), A diversidade linguística nos discursos e nas práticas de edução e formação. Aveiro, Portugal: Universidade de Aveiro. García, O. (2014). Multilingualism and language education. In C. Leung & B. V. Street (eds. ), The Routledge Companion to English Studies. New York: Routledge. García, O. (2014). U.S. Spanish and Education: Global and Local Intersections. In Language Policy, Politics, and Diversity in Education: Review of Research in Education, (38)1, pp. 58-80. García, O. (2014). Introduction. In T. G. Wiley, J. K. Peyton, D. Christian, S. K. Moore & N. Liu (eds. ), Handbook of Heritage, Community, and Native American Languages in the United States: Research, Policy, and Educational Practice (pp. 87-89). New York: Routledge. García, O. (2014). Countering the dual: Transglossia, dynamic bilingualism and translanguaging in education. In R. Rubdy & L. Alsagoff (eds. ), The global-local interface, language choice and hybridity (pp. 100-118). Bristol, United Kingdom: Multilingual Matters. García, O. (2014). Becoming bilingual and biliterate: Sociolinguistic and sociopolitical considerations. In C. Addison Stone, E. R. Silliman, B. J. Ehren, & G. P. Wallach (eds. ), Handbook of language and literacy: Development and disorders, pp.145-160. New York: The Guilford Press. García, O. (2014). TESOL Translanguaged in NYS: Alternative Perspectives. NYS TESOL Journal, (1)1, 2-10. García, O., & Cole, D. (2014). Deaf gains in the study of bilingualism and bilingual education. In H-D. L. Bauman & J. Murray (eds. ), Deaf Gain: Raising the stakes for human diversity. Minneapolis, MN: University of Minnesota Press. García, O., & Kano, N. (2014). Translanguaging as process and pedagogy: Developing the English writing of Japanese students in the US. In J. Conteh & G. Meier (eds. ), The Multilingual Turn in Languages Education: Opportunities and Challenges. Bristol, United Kingdom: Multilingual Matters. García, O., & Leiva, C. (2014). Theorizing and Enacting Translanguaging for Social Justice. In A. Blackledge & A. Creese (eds. ), Heteroglossia as Practice and Pedagogy. Dordrecht: Springer. García, O., & Otheguy, R. (2014). Spanish and Hispanic bilingualism. In M. Lacorte (ed. ), The Routledge Handbook of Hispanic Applied Linguistics (Chapter 36). New York: Routledge. Orellana, M. F. & García, O. (2014). Conversation Currents: Language Brokering and Translanguaging in School. Language Arts, (91)5, pp. 386-392. Velasco, P., & García, O. (2014). Translanguaging and the writing of bilingual learners. Bilingual Research Journal: The Journal of the National Association for Bilingual Education, (37)1, 6-23. García, O. (2013). Commentary: En/countering indigenous bi/multilingualism. In L. T. Wyman, T. L. McCarty, & S. E. Nicholas (eds. ), Indigenous Youth and Multilingualism: Language Identity, Ideology, and Practice in Dynamic Cultural Worlds, pp.207-214. New York: Routledge. García, O. (2013). El papel de translenguar en la enseñanza del español en los Estados Unidos. In D. Dumitrescu & G. Piña-Rosales (eds. ), El español en los Estados Unidos: E pluribus unum? Enfoques multidisciplinarios, pp.353-373. New York: Academia Norteamericana de la Lenga Español. García, O. (2013). From disglossia to transglossia: Bilingual and multilingual classrooms in the 21st century. In C. Abello-Contesse, P. M. Chandler, M. D. López-Jiménez, & R. Chacón-Beltrán (eds. 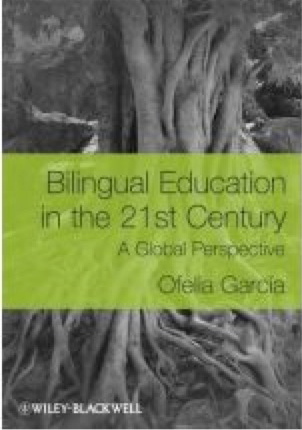 ), ‪Bilingual and multilingual education in the 21st century‬: ‪Building on experience‬, pp.155-175. Bristol, UK: Multilingual Matters. García, O. (2013). Informal bilingual acquisition: Dynamic spaces for language education. In D. Singleton, J.A. Fishman, L. Aronin, & M. O Laoire (eds. ), Current multilingualism: A new linguistic dispensation, pp.99-118. Berlin: Mouton de Gruyter. García, O., Espinet, I., & Hernández, L. (2013). Las paredes hablan en El Barrio: Mestizo signs and semiosis. Revista Internacional de Lingüística Iberoamericana (21)1, 135-152. García, O. & Flores, N. (2013). Multilingualism and Common Core State Standards in the United States. In S. May (ed. ), The Multilingual Turn: Implications for SLA, TESOL, and Bilingual Education, pp.147-166. New York: Routledge. García, O., & Herrera, L. Y. (2013). Bilingual Education. In E. I. Stavans (ed. ), Oxford bibliographies in Latino studies. New York, NY: Oxford University Press. García, O., Homonoff Woodley, H., Flores, N., with Chu, H. (2013). Latino emergent bilingual youth in high schools: Transcaring strategies for academic success. Urban Education, 48(6), 798-827. García, O., Pujol-Ferran, M., & Reddy, P. (2013). Educating international and immigrant students in U.S. higher education: Opportunities and challenges. In A. Doiz, D. Lasagabaster, & J.M. Sierra (eds. ), English-medium instruction at universities: Global Challenges. Bristol, UK: Multilingual Matters. Flóres, N. & García, O. (2013). Linguistic third spaces in education: Teachers’ translanguaging across the bilingual continuum. In D. Little, C. Leung, & P. Van Avermaet (eds. ), Managing diversity in education: Languages, policies, pedagogies, pp.243-256. Bristol, UK: Multilingual Matters. Del Valle, J. & García, O. (2013). Introduction to the making of Spanish: US perspectives. In J. Del Valle (ed. ), A political history of Spanish: The making of a language, pp.249-259. Cambridge: Cambridge University Press. García, O. (2012). Theorizing translanguaging for educators. In C. Celic & K. Seltzer, Translanguaging: A CUNY-NYSIEB guide for educators, pp.1-6. García, O. (2012). Bilingual community education: Beyond heritage language education and bilingual education in New York. In O. García, Z. Zakharia, & B. Otcu (eds. ), Bilingual community education and multilingualism: Beyond heritage languages in a global city. Bristol, UK: Multilingual Matters, pp.3-42. García, O. 2012. Ethnic identity and language policy. In Spolsky, B. (ed.). The Cambridge handbook of language policy. Cambridge: Cambridge University Press, pp. 79-99. García, O. & Flores, N. (2012). Multilingual pedagogies. In Martin-Jones, M., Blackledge, A., and Creese, A. (eds.). The Routledge Handbook of Multilingualism. New York: Routledge, pp. 232-246. García, O., Flores, N., & Woodley, H. (2012). Transgressing monolingualism and bilingual dualities: Translanguaging pedagogies. In A. Yiakoumetti (ed. ), Harnessing linguistic variation to improve education. Bern: Peter Lang, pp. 45-75. García, O. & Velasco, P. 2012. Insufficient language education policy: Intercultural bilingual education in Chiapas. Diaspora, Indigenous, and Minority Education 6(1), 1-18. García, O. 2011 & Bartlett, L. 2011. Dominican youth in New York City schools: A community stands up and delivers. Camino Real 3(4), 95-117. García, O. 2011. From language garden to sustainable languaging: Bilingual education in a global world. Perspective. A publication of the National Association for Bilingual Education, Sept/Oct 2011, pp. 5 – 10. García, O. 2011. Language spread and its study in the 21st century. In Robert Kaplan (ed.). Oxford Handbook of Applied Linguistics. Rev. 2nd edition. Oxford: Oxford University Press, pp. 398-411. García, O. 2011. Planning Spanish: nationalizing, minoritizing, and globalizing performances In Díaz-Campos, M. (ed.). The Handbook of Hispanic Sociolinguistics. Malden, Ma and Oxford: Wiley-Blackwell, pp. 667-685. García, O. 2011. Educating New York’s Bilingual Children: constructing a future from the past. International Journal of Bilingual Education and Bilingualism, 14: 2, 133-153. García, O., Flores, N. & Chu, H. 2011. Extending Bilingualism in U.S. Secondary Education: New variations. International Multilingual Research Journal, 5: 1, 1 — 18. García, O. & Kleifgen, J. A. 2011. Bilingualism for Equity and Excellence in Minority Education: The United States.. In Van den Branden, K., Van Avermaet, P., and Van Houtte, M. (eds.). Equity and Excellence in Education. Routledge, pp. 166-189. García, O., with Makar, C., Starcevic, M. & Terry, A. 2011. The translanguaging of Latino kindergartners . In Rothman, J. and Potowski, K. Bilingual Youth: Spanish in English speaking societies. John Benjamins, pp. 33-55. García, O. and Sylvan, C. 2011. Pedagogies and practices in multilingual classrooms: Singularities in Pluralities. Modern Language Journal 95(iii): 385-400. García, O. & Velasco, P. 2011. Observando, colaborando y describiendo: Devolviéndole el poder a los docentes. In de Mejía, A.M & Hélot, C. (ed.) Empowering Teachers Across Cultures. Bern: Peter Lang, pp. 29-44. García, O. 2010. Bilingualism in education in the Multilingual Apple: The future of the past. Journal of Multilingual Education Research 1(1): 13-34. García, O. 2010. Languaging and ethnifying. In Fishman, J. A. and García, O. (eds.) Handbook of Language and Ethnic Identity (pp. 519-534). Oxford: Oxford University Press, pp. 519-534. García, O. 2010. Latino language practices and literacy education in the U.S. In Farr, M., Seloni, L. and Song, J. (Eds.). Ethnolinguistic Diversity and Education. Langauge, Literacy, and Culture. (pp. 193-211) New York: Routledge, pp. 193-211. García, O., López, D. & Makar, C. 2010. Language and Identity in Latin America. In Fishman, J. A. and García, O. (eds.) Handbook of Language and Ethnic Identity. Oxford: Oxford University Press, pp. 353-373. García, O. & Menken, K. 2010. Moving forward. Ten guiding principles for teachers. In Menken, K. and García, O. (eds.) Negotiating Language Policies in Schools: Educators as Policymakers (pp. 262-268). New York: Routledge, pp. 262-268. García, O. & Menken, K. 2010. Stirring the onion. Educators and the dynamics of language education (looking ahead). In Menken, K. and García, O. (eds.) Negotiating Language Policies in Schools: Educators as Policymakers. New York: Routledge, pp. 249-261. García, O. & Torres-Guevara, R. 2010. Monoglossic ideologies and language policies in the education of U.S. Latinas/os. In Enrique Murillo, Sofía Villenas, Ruth Trinidad Galván, Juan Sánchez Muñoz, Corinne Martínez and Margarita Machado-Casas (eds.). Handbook of Latinos and Education: Research, theory and practice. Mahwah, New Jersey: Lawrence Erlbaum, pp. 182-194. García, O. 2009. “Bilingualing” without schooling. The role of comprehensive education. In H. Varenne and E. Gordon (eds. ), Theoretical Perspectives on Comprehensive Education: The way forward. Lewiston, New York: The Edwin Mellen Press, pp. 187-216. García, O. 2009. Education, multilingualism and translanguaging in the 21st century. In Multilingual Education for Social Justice: Globalising the local, ed. by Ajit Mohanty, Minati Panda, Robert Phillipson, Tove Skutnabb-Kangas. New Delhi: Orient Blackswan (former Orient Longman), pp. 128-145. García, O. (2009). El uso del español en la enseñanza: La educación bilingüe. In H. L. Morales (Ed. ), La enciclopedia del Español en los EEUU (pp. 417-422). Alcalá de Henares, Madrid, Spain: Instituto Cervantes. García, O. 2009. Emergent bilinguals and TESOL. What´s in a Name? In TESOL Quarterly 43(2): 322-326. special issue edited by Shelley Taylor. García, O. 2009. Encountering Indigenous Bilingualism. Journal of Language, Identity and Education 8 (5): 376-380. García, O. (2009). La ensenanza del español como lengua extranjera. In H. L. Morales (Ed. ), La enciclopedia del Español en los EEUU (pp. 423-428). Alcalá de Henares, Madrid, Spain: Instituto Cervantes. García, O. 2009. Livin’ and Teachin’ la lengua loca: Glocalizing U.S. Spanish ideologies and practices. In Language Allegiances and Bilingualism in the United States, ed. by Rafael Salaberry. Clevedon, UK: Multilingual Matters, pp. 151-171. García, O. 2009. Racializing the Language Practices of U.S. Latinos: Impact on their education. In How the United States. Racializes Latinos: White hegemony and its consequences, ed. by José Cobas, Joe Feagin, and Jorge Duany. Paradigm Publisher, pp. 101-115. García, O. and Mason, L. 2009. Where in the World is U.S. Spanish? Creating a space of opportunity for U.S. Latinos. In Language and Poverty, ed. by Wayne Harbert, Sally McConnell-Ginet, Amanda Miller and John Whitman, eds. Clevedon, UK: Multilingual Matters, pp. 78-101. Garcia, O. 2008. Multilingual language awareness and teacher education. In Cenoz, J & Hornberger, N. (Eds.). Encyclopedia of Language and Education, 2nd edition Vol 6. Knowledge about Language. Berlin: Springer, pp. 385-400. García, O. 2008. Spanish and Globalization: Shedding Its Armor and Baring Its Undulating Rhythms. International Multilingual Research Journal 2 (1), 1-4. Author Posting. García, O. 2008. Einar Haugen. Encyclopedia of Bilingual Education, ed. by Josué González. Sage Publisher. García, O. 2008. Teaching Spanish and Spanish in Teaching in the U.S.: Integrating Bilingual Perspectives. In Integrated Perspectives towards Bilingual Education: Briding the gap between prestigious bilingualism and the bilingualism of minorities, ed. by Anne Marie de Mejía and Christine Helot. Clevedon, UK: Multilingual Matters, pp. 31-57. García, O., with Kabat, K. 2008. L’enseignement en milieu multilingue aux Etats-Unis. In Penser le Bilinguisme Autrement, C. Hélot (ed.). Peter Lang Publisher, pp. 111-125. García, O. and Tsai, P.J. 2008. Language Education Policy in Global Perspective. Encyclopedia of Bilingual Education, ed. by Josué González. Sage Publisher. García, O. 2007. Lenguas e identidades en mundos hispanohablantes. Desde una posición plurilingüe y minoritaria. In M. Lacorte (ed. ), Lingüística aplicada del español. Madrid: Arco, pp. 377-400. García, O., Bartlett, L. and Kleifgen, J. A. 2007. From Biliteracy to Pluriliteracies. In Handbook of Applied Linguistics. Vol. 5: Multilingualism, ed. by Peter Auer and Li Wei. Berlin: Mouton/de Gruyter, pp. 207-228. García, O. and Bartlett, L. 2007. A speech community model of Bilingual Education: Educating Latino Newcomers in the U.S.International Journal of Bilingual Education and Bilingualism 10: 1-25. García, O. 2006. Lost in transculturation: The case of bilingual education in New York City. In M. Putz, J.A. Fishman, and Neff-Van Aertselaer (eds.). Along the Routes to Power: Exploration of the empowerment through language. Berlin: Mouton de Gruyter, pp. 157-178. García, O. and Schiffman, H., with Zachariah, Z. 2006. Fishmanian Sociolinguistics: 1949 to the present. In García, O., R. Peltz and H. Schiffman (eds. ).Language Loyalty, Continuity and Change: Joshua A. Fishman´s Contributions to International Sociolinguistics. Clevedon: Multilingual Matters, pp. 3-68. García, O., Skutnabb-Kangas, T. & Torres-Guzmán, M. 2006. Weaving spaces and de(constructing ways for multilingual schools: The actual and the imagined. In García, O., T. Skutnabb-Kangas and M. Torres-Guzmán, eds. Imagining Multilingual Schools: Languages in Education and Glocalization. Clevedon, UK: Multilingual Matters, pp. 3-47. García, O. 2005. Minority Language Education. In Encyclopedia of Language and Linguistics, ed. by Keith Brown. Vol. 8. Oxford: Elsevier, pp. 159-163. García, O. 2005. Positioning Heritage Languages in the United States. Modern Language Journal 89 (4): 601-605. García, O. 2004. Lost in transculturation: The case of bilingual education in New York City. Linguistic LAUD Agency. Series A, Paper No. 624. Universitat Duisburg-Essen, pp. 157-177. García, O. 2003. Nouvelles espérances et barrières dans le domaine de l’éducation aux États-Unis.Hommes et Migrations (France) no. 1246. (Novembre-Décembre 2003, pp. 17-27. García, O. 2003. La enseñanza del español a los latinos de los EEUU. Contra el viento del olvido y la marea del inglés. Ínsula julio-agosto, núm. 679-680 (julio-agosto, 2003, Spain). García, O. 2002. Teaching language minorities in the United States: From bilingualism as a deficit to bilingualism as a liability. Comments to Eugene Garcia, Bilingualism and Schooling in the United States. International Journal of the Sociology of Language 155/156: 125-130. García, O. & Traugh, C. 2002. Using Descriptive Inquiry to Transform the Education of Linguistically Diverse U.S. Teachers and Students. In Opportunities and Challenges of (Societal) Bilingualism, ed. by Li Wei, Jean-Marc Dewaele and Alex Housen. Berlin and New York: Walter de Gruyter, pp. 311-328. García, O. 2001. Bilingual education is beneficial. In Education. Opposing Viewpoints, ed. By Mary E. Williams. San Diego: Greenhaven Press, pp. 126-129. García, O. 2001. Language Spread. Oxford Handbook of Applied Linguistics, ed. by R. Kaplan. Oxford: Oxford University Press. García, O. 2001. Writing backwards across languages: The inexpert English/Spanish biliteracy of uncertified bilingual teachers. In Developing Advanced Literacy in First and Second Languages, ed. by M. Schleppegrell and Cecelia Colombi. Lawrence Erlbaum Publishers, pp. 245-259. García, O., Morín, J. L. & Rivera, K. 2001. How Threatened is the Spanish of New York Puerto Ricans? Language Shift with vaivén. In Can Threatened Languages be Saved? Reversing Language Shift Revisited ed. by Joshua A. Fishman. Clevedon, Avon: Multilingual Matters, pp. 44-73. García, O. 2000. Language, a diversity category beyond all others. In Rights to Language. Equity, Power, and Education, ed. by Robert Phillipson, Mahwah, New Jersey: Lawrence Erlbaum, pp. 243-248. Otheguy, R., García, O. & Roca, A. 2000. Speaking in Cuban: The Language of Cuban Americans. In New Immigrants in the United States. Readings for Second Language Educators, ed. by Sandra McKay and Sau-ling Cynthia Wong. Cambridge: Cambridge University Press, pp. 165-188. García, O. 1999. Educating Latino high school students with little formal schooling. In So Much to Say. Adolescents, bilingualism and ESL in the Secondary School, ed by Christian Faltis and Paula Wolfe. New York: Teachers College Press, pp. 61-82. García, O. 1999. The Forging of a Latin American Ethnolinguistic Identity: Between the Written and Oral Word. In Handbook of Language and Ethnic Identity, ed. by Joshua A. Fishman. Oxford: Oxford University Press, pp. 226-243. García, O. 1999. Reversing language shift: The Role of scholarship and grandfathership. Liber Amicorum Koen Zondag. Ljouwert, Friesland, The Netherlands. pp. 29-30. García, O. & Trubek, J. 1999. Where have all the minority educators gone and when will they ever learn. In Educators for Urban Minorities 1: 1-8. García, O. 1997. Bilingual Education. In The Handbook of Sociolinguistics, ed. by Florian Coulmas. Oxford: Basil Blackwell, pp. 405-420. García, O. 1997. New York´s Multilingualism: World Languages and their Role in a U.S. City. In García, Ofelia and Joshua A. Fishman, eds. 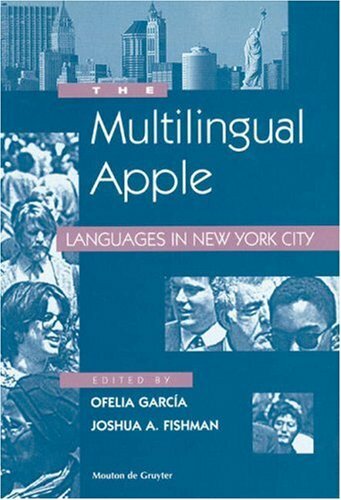 The Multilingual Apple: Languages in New York City. Berlin: Mouton, pp. 3-50. García, O.and Otheguy, R. 1997. No sólo de estándar vive el aula: Lo que nos enseñó la educación bilingüe sobre el español de Nueva York. In La ensenanza del español a hispanohablantes: Praxis y Teoría, ed. by M. Cecilia Colombi and Francisco Alarcón. Boston: Houghton Mifflin, pp. 156-174. Corona, D. & García, O. 1996. English in Cuba: From Imperialist Design to Imperative Need. In Post Imperialist-English, edited by Joshua Fishman, Andrew Conrad and Alma Rubal-Lopez. Berlin: Mouton de Gruyter, pp. 85-111. García, O. 1995. Spanish Language Loss as a Determinant of Income among US Latinos: Implications for language policy in schools. In Power and Inequality in Language Education, ed. by James W. Tollefson. New York: Cambridge University Press, pp. 142-160. García, O. & Cuevas, M. 1995. Spanish ability among second generation Nuyoricans: A study of its determinants.Spanish in Four Continents. Studies in Language Contact and Bilingualism, ed. by Carmen Silva-Corvalan. Georgetown University Press, pp. 184-195. Skutnabb-Kangas, T. & García, O. 1995. Multilingualism For All? General Principals. In Multilingualism for All. Ed. by Tove Skutnabb-Kangas. Lisse, The Netherlands: Swets and Zeitlinger, pp. 221-256. García, O. 1994. Que todo el pluralismo es sueño, y los sueños, vida son: Ethnolinguistic dreams and reality: A response to John Edwards. In International Journal of the Sociology of Language 110: 87-104. García, O. and Otheguy, R. 1994.The value of speaking a LOTE in U.S. Business. In Annals of the American Academy of Political and Social Science 532: 99-122. Otheguy, R. and García, O. 1993. Convergent conceptualizations as predictors of degree of contact in U.S. Spanish. In Spanish in the United States, ed. by Ana Roca and John Lipski. Berlin: Mouton de Gruyter, pp. 135-154. García, O. 1993. From Goya Portraits to Goya Beans: Elite traditions and popular streams in U.S. Spanish language policy. In Southwest Journal of Linguistics 12: 69-86. García, O. 1993. Understanding the societal role of the teacher in transitional bilingual education classrooms: Lessons from Sociology of Language. In Bilingual Education in Friesland: Facts and Prospects, ed. by Koen Zondag. Leeuwarden, The Netherlands: Gemeenschappelijk Centrum voor Onderwijsbegeleiding in Friesland, pp. 25-37. García, O. 1992. Societal multilingualism in a multicultural world in transition. In Languages for a Multicultural World in Transition. Northeast Conference Reports on the Teaching of Foreign Languages. ed. by Heidi Byrnes. Lincolnwood, Illinois: National Textbook Company, pp. 1-27. García, O. 1991. Latinos and Bilingual Education in the United States: Their Role as Objects and Subjects. New Language Planning Newsletter 6: 3-5. Mysore, India: Central Institute of Indian Languages. García, O. 1991. The Politics of the Language of Literacy: Spanish Literacy for New York Latinos. Information Update. Literacy Assistance Center. Fall1990/Winter 1991. Vol 7, no. 1, pp. 9-10. García, O. 1991. A gathering of voices, a `Legion of scholarly decency’ and bilingual education. In Bilingual Education: Focusschrift in honor of Joshua A. Fishman, ed. by Ofelia García. Amsterdam: John Benjamins, pp. 3-19. Beckum, L., García, O., Otheguy, R., et al. 1991. Identifying a knowledge base for teaching multicultural, multilingual students: An international study. In Changing the Practice of Teacher Education, ed. by Marleen Pugach, Henrietta Barnes and Leonard Beckum. Washington, D.C.: AACTE. García, O. 1989. José Sánchez-Boudy. In Biographical Dictionary of Hispanic Literature in the United States. ed. by Nicolas Kanellos. Westport, Conn.:Greenwood Press, pp. 274-283. García, O. 1989. Rafael Catalá. In Biographical Dictionary of Hispanic Literature in the United States. ed. by Nicolas Kanellos. Westport, Conn.:Greenwood Press, pp. 55-60. Otheguy, R., García, O. & Fernández, M. 1989. Transferring, switching, and modeling in West New York Spanish: An intergenerational study. International Journal of the Sociology of Language 79:41-52. García, O., Evangelista, I., Martinez, M., Disla, C., & Paulino, B. 1988. Spanish language use and attitudes: A study of two New York City communities. Language in Society 17:475-511. García, O. and Otheguy, R. 1988. The bilingual education of Cuban American children in Dade County’s ethnic schools. Language and Education. 1:83-95. García, O. and Otheguy, R. 1988. The Language situation of Cuban Americans. In Language Diversity: Problems or Resource? ed. by Sandra Mc Kay and Sau-ling Wong. Harper and Row, pp. 166-192. García, O. 1988. The education of biliterate and bicultural children in ethnic schools in the United States. Essays by the Spencer Fellows of the National Academy of Education, Vol. IV, pp. 19-78. Otheguy, R. and García, O. 1988. Diffusion of lexical innovations in the Spanish of Cuban Americans. In Research Issues and Problems in United States Spanish. ed. by J.L. Ornstein-Galicia, G.K. Green and D.J. Bixler-Marquez. Rio Grande Series in Language and Linguistics No. 2. Bronsville: Pan American University, 203-242. García, O. 1986. The education of biliterate Japanese children in the Japanese School of New York. Research Bulletin (Japanese School of New York), Vol. 5, Spring 1986, 67-70. García, O. and Otheguy, R. 1986. Impressions of London from a New York perspective.Primary Teaching Studies 2, 80-94. García, O. 1986. Committed research on the education of language minorities. Centro de Estudios Puertorriqueños Bulletin, June 1986, 9-11, 24-25. García, O., Fishman, J. A., Burunat, S. & Gertner, M. 1985. The Hispanic Press in the United States: Content and Prospects. In The Rise and Fall of the Ethnic Revival: Perspectives on Language and Ethnicity, ed. by Joshua A. Fishman. The Hague: Mouton, pp. 343-362. García, O. and Burunat, S. 1985-1986. La prensa hispana en los Estados Unidos.Boletín de la Academia Nortemericana de la lengua española 6-7, 31-38. García, O. 1985. Foreign languages as a requirement for excellence? In The Great School Debate. Beatrice and Ronald Gross, eds. New York: Simon and Schuster, pp. 209-211. García, O. & Otheguy, R. 1985. The masters of survival send their children to school: Bilingual education in the ethnic schools of Miami. Bilingual Review. Revista Bilingüe 12, 3-19. García, O., Fishman, J. A., Gertner, M., & Burunat, S. 1985. Written Spanish in the US. An Analysis of the Ethnic Press. International Journal of the Sociology of Language 56: 85-98. García, O. 1984. Bilingualism in the United States: Present Attitudes in the light of past policies. In The English Language Today: Public Attitudes Toward the English Language, ed. by Sidney Greenbaum. Oxford: Pergamon Press, pp. 147-158. García, O. 1984. La problemática del idioma en el ensayo puertorriqueño: Proyecciones de la sociolingüística.Círculo: Revista de Cultura 13, Fall 1984, 79-86. García, O. 1983. Sociolinguistics and language planning in bilingual education for Hispanics in the United States. International Journal of the Sociology of Language 44:43-54. García, O. 1982. The “Cocopleonasm” of Oliverio Girondo’s Poetry. Dada/Surrealism. 10/11, 47-53. García, Ofelia, Jo Anne Kleifgen and Lorraine Falchi. 2008. From English language learners to emergent bilinguals. In Equity Matters: Research Review No. 1. New York: A Research Initiative of the Campaign for Educational Equity.